Back in 2010, I published some instructions for making a 3-person hammock stand on HammockForums.net. I’ve updated the illustrations and information and am posting it here for easier access. I’ve spent a lot of time and money trying to find a great hammock stand for my tree-less backyard and at events (e.g. car camping, music festivals, Boy Scout camporees) when or where trees are not available. Having a stand that travels well (portable), is easy to assemble, and doesn’t cost a fortune are also bonuses. Enter the 3-person hammock stand. This is not my own design, but it is inspired from a tensegrity stand used during the 1998 Burning Man event. Seeing the hammock between the struts was revalatory, so I had to try it out. I purchased everything at Home Depot for under $40, well under the “too expensive” radar[1. This is a great price, considering most commercial stands range anywhere from $60 to $200 or more]. Construction was fairly easy, but did require a drill and a few drill bits for the holes. NOTE: Instead of poly rope, which I found to stretch a little, you could use some 7/64 Amsteel for increased strength, lower weight and bulk, and virtually no stretch. Consider using 6 welded steel O-rings (or climbing-rated carabiners) to protect cords from abrasion against the rebar. Drill two 1 in (2.5 cm) holes on the top of each strut, spaced 1 in (2.5 cm) apart vertically, and 1 in (2.5 cm) from the top edge). Drill one 1 in (2.5 cm) hole near the bottom of the strut, 1 in (2.5 cm) from the bottom edge. After building the stand, I realized I needed better anchor points for the hammock so I drilled a hole (1/2 in/13 mm) near the two top holes where I placed a 4 in (10 cm) dowel. You can add anchor points further down the strut to better accommodate your hammock. I ended up adding a second anchor point at 4.5 ft (137 cm) from the bottom of the strut. The top rope is one line, 50 ft (15.25 m) in length. Once set-up, it creates a triangle with approximately 14 ft (4.3 m) sides. Cut 3 bottom ropes at 33 ft (10 m) each (e.g., cut a 100 ft (30 m) line in thirds). Cut 3 side ropes at 33 ft (10 m) each (e.g., cut a 100 ft (30 m) line in thirds). Set up the stakes in a hexagon shape. The radius should be 14 ft (4.3 m). The easiest way to do this is to have two 14 ft (4.3 m) strings. From the center point, measure out for your first stake point with the first string. From there, use the second string from the first stake and the string from the center point to determine the next stake point. Use this pattern to determine the six stake points. Tie off the side and bottom ropes. Middle the ropes and insert the bight through the bottom or second-to-top hole respectively and tie a Lark’s Head knot to secure. Thread the top rope through the top holes. Pull the rope to take up the slack and the stand will rise. I tied a figure-8 on a bite on one end and used this as the anchor point to tie a Trucker’s hitch to get the structure taut. NOTE: The inexpensive poly rope that I list and use on this stand often needs to be set or pulled stiff when you first get it. Some folks have complained that the rope stretches, and that seems to be the case on the first few uses as the rope is getting pulled stiff. Basically, the rope is only loosely braided and must be tightened up. Once this occurs, the line won’t stretch as significantly. I’ve made several stands using the same inexpensive materials and I take about 15-30 minutes tightening up the top and side ropes until all the fibers are pulled tight. The Trucker’s hitch really helps with that process. I made some minor tweaking in the knots to make sure the posts were at a near 60-degree angle. This hammock stand comes down quickly once you loosen the Trucker’s hitch. With the top rope loosened, the rest of the ropes are easily unhooked from the rebar stakes. After the initial set-up, I leave all the ropes connected to the posts. This allows for a quicker set-up next time. Getting the rebar stakes out is the hardest part, depending on the ground conditions. Use a pair of vice grip locking pliers to twist the stake around and then it easily comes out of the ground. This is a testy reply! This would be a neat project! It’s fun! In my backyard, we built a small fire in the middle and enjoyed resting in our hammocks while enjoying the warmth (be careful not to make it TOO big or risk a melt-down). One of the reasons I love the 3-person hammock stand is because it works so well at scout camporees. Back in Virginia, all our camporees were held in large fields, and every troop and pack (on Webelos Weekends) were assigned a plot. This stand makes an impressive show during inspections and draws a great crowd. A test reply, but last year we did this for our three boys. A great set up! Sweet! I’d love to see photos — would you mind sharing some? Love the blog AND your book! What’s your thoughts on using just two for a single hammock “hang”? That price is way more than I pay. I get them at ham fests for $5/bag. I don’t know if those stakes will hold. Some people recommend bending crooks on the top of the rebar to make it easier to remove. Welding a ring near the top would also help. Those rebar can be hard to take out of the ground. Made this today with two scouts. Was a great easy project. About an hour from home depot to hammock stand. Cut all ropes to size. the long lengths made it too off set. Two separate bottom ropes. Amsteel….. Made mine with Poly. Way too much stretch (my 220lbs probably didn’t help much). Great suggestions, Bill. I’m glad the designed worked. Paul at AHE recently made one with Amsteel 7/64 with success. I’m going to pick me up some Amsteel and upgrade my stand soon. I have now gone to mule tape for ropes. 1800# strength. And little to no stretch. I was wondering what type of knots you used to connect the rope to the poles and to the stakes. I list the knots and techniques under the “setup” section. For the bottom rope you can tie figure-8 on a bight on both ends and leave them alone. The side struts can require some adjustment depending on what rope you use, so using an adjustable knot like a taut line hitch or truckers hitch is nice. After I set mine up the first time I left the side and bottom ropes attached, which makes setup faster. Used your instructions here and in your book to make one this weekend. After a little trial and error adjusting rope lengths and strut distances, I successfully hung two hammocks and enjoyed a Sunday afternoon hang with my brother-in-law. I agree with you and Bill on the cordage suggestions. Amsteel would be ideal, but poly rope is cheap and works. I used a poly blend but it is very stretchy. Also, I had to use a trucker’s hitch, rather than two half hitches, on the side ropes, because the two half hitches kept slipping when I entered the hammock. Currently, I’m not using the anchor point pegs, rather I’m just wrapping my suspension straps multiple times around the struts. Do the pegs add any benefit other than convenience (i.e. safety)? Also, thanks for suggesting the different types of knots you used. Very helpful. Thanks Bryan! I made a new stand last month for my brother. It was an interesting exercise to make another one and I seeing what changes/updates I could make. The steel O-rings around the rebar stakes really worked well. We didn’t add the anchor pegs/dowels on the struts at all — just wrapping the webbing around the posts worked well enough. It’s more of a convenience factor. On my stand, I had adjustable Whoopie Slings that wrapped around the posts and pegs, making it easy on/off. That poly rope is very stretchy. When we first set up his stand we had to adjust every strut at least 3 times 🙂 Like you, I had trucker’s hitches on all the vertical cables and the top cable. Once it was ratcheted down, it worked great and we had a nice time relaxing. Oh, I should also mention the different knots we used. For the side ropes (yellow), instead of 6 different cords, I used 3. I tied a Lark’s Head through the wood strut and then threaded the working ends through the steel O-rings that were around the rebar stakes. In this way, I could tie Trucker’s Hitches on the lines easily. The Lark’s Head worked great and didn’t slip. This small change in the design meant less cutting and knot tying and a more secure stand, I believe. I’ll see if I have photos I can post. Here’s some photos of the stand I recently made, showing details of the changes. Def like the o-ring concept….nice little mod. About what length is your single yellow side rope (30ish ft)? Yes. So the side and bottom ropes we cut in thirds. The rope was 100 ft so that comes out to roughly 33 ft each. Plenty of extra length for the knots. We set this stand up at the Ommegang beer festival last month and I have 2 questions. How important is the 60 degree angle and should the top rope remain taut when the stand is weighted. We found that the top of the 2x4s moved toward the middle of the stand when weighted. No failures or falls but that played havoc with our tarps and ridge lines. Any thoughts? The 60-degree angle on the struts is optimal for stress reduction and to help ensure that the strut receives the most compressive forces. However, it’s an approximate, so you can be flexible. The biggest factor with the sagging struts and lines is the type of rope you use. I offered up what I used, the poly rope, but it is stretchy, especially when you load it with a few people. This can make the stand flex a little. I usually have to sit in the stand, and then re-tighten the ropes a few times to get the stretch out. It’s not ideal with that rope, however. I should update the instructions and recommend (if I don’t already) other types of rope that are less stretch prone. One of my friends made one out of Amsteel, which won’t have those issues. What is the function of the top rope, and why is 60° optimal? The top rope is absolutely essential. Without it, the stand won’t stand up. The top rope keeps all the struts together by keeping tension on all the struts. What you are attempting to create is an equilateral triangular pyramid, or tetrahedron. With all the angles at 60-degrees, it forms a very strong structure, equalizing the forces across all components. When you change the angles of the struts, you could compromise the effectiveness of the compression, so that the struts receive some bending forces (that could be bad). It is an odd shape to cover completely without stitching together your own tarp. I saw one person take a large tarp (maybe 20×20) and center it over the struts and use a center pole to keep the rain from pooling in the center. It doesn’t pull down on the sides perfectly, however. I could design and upload an illustration if you wanted a sketch/template to go off of? We use two of these frames with our Scout troop on our Annual Camp every year with Poly rope, we accept that we will nee to retighten 2 to 3 times during the week. As for shelter we use the standard 3×3 Sil nylon tarps in diamond formation for each hammock which results in a really cool formation where they are each attached to the ground in overlapping form in the centre. Going to build one of these this weekend for a Cub Scout campout. is the size of the struts (2″ x 3″ by 8 feet) essential to the design? Can I use 8-foot long 2x4s? You can use 2x4s or other hardware as needed. This was just what I used. The folks whose stand I based my design from used much larger beams as struts. I was trying to find something as light and portable as possible to use at scout camporees. Please share photos of your set-up at the campout! I’d love to see them. I have used 2×4’s. Just check the rope lengths. I think they are long. I had to shorten. Derek first let me thank you for this sight and your book both are fantastic. I just built one on in my back yard to test for an upcoming scout camp out…very cool I weigh in at about 255 and once adjusted it doesn’t move at all..
Can you tell me how far the feet should be from the center point and each other….I seem to have a lot of rope left on the base ( green ) ropes. I’d love to see some photos of your finished stand. I’m glad it was working for you! If you put a central post in the middle, could you also hang three more hammocks in the center? First, I don’t think the distances will be long enough. Second, that center post would need to be anchored to the ground somehow, or if it was a post cemented deep in the ground. Otherwise, I don’t believe it would work. Could this design be opened up to allow for 4 people (enough for my whole family)? I assume by adding a fourth stud. Thanks. Possibly. A triangle is sturdier and equalizes better, especially when not equally loaded. It’s worth experimenting, but there might be a better solution. The footprint would also be larger. I’d probably go with a modified turtle/dog stand by lashing a square with tripods under each vertex. * Would it be better to cut the struts on an angle at the bottom so they sit flush with the ground? * Also, to fit this rig in my car could I cut the struts down to two 4.5ft sections and bolt them together? Thanks Ryan. There is no need to cut the struts. The struts are taking compressive forces, driving them into the ground. As to cutting the struts in half and using a coupler, my inner risk meter begins to rise. The segments introduce a weak point that may fail. On this stand, since the load is not symmetric, the struts get pulled at different angles, which will stress those joints. If it were me, I’d just strap the three 2x4s on top of my car. If you are intent on constructing something, I would consult an engineer. This is a great jig, Derek! I built just one strut this weekend and attached it to my clothesline with poly rope. Very solid! I have a question for you. Is there any reason why we couldn’t use a single rope (66 feet) for the bottom and sides ropes? You could tie a lark’s head around the top of the strut in the middle of the rope and then just string each side around the rebar and tie a single trucker’s hitch somewhere along the bottom near the strut. I’m going to finish stand (build the other two struts) this week and may try this unless you advise against it. If I understand correctly, the answer is yes. I need to update this post because the last two stands I’ve made were simplified a little. For each strut I used a single line for the side and bottom ropes and middled them and used a larks head knot to attach to the strut. I also use steel rings on the rebar to prevent abrasion. Truckers hitch to tighten. Derek: This looks intriguing. It looks like most of your hammocks are hanging a fair distance from the top of the struts. Has anyone ever asked you about using shorter struts? Like maybe 7 foot or 6 foot struts? Presumably, you could move your ground anchors in a little (maybe closer to 12 or 13 feet rather than 14 feet) and reduce the lengths of the side and bottom ropes. I haven’t done the math, but presumably, if you keep the struts in the same locations, but just lop a foot or two off the top, you should be able to keep the angles all the same by moving the ground anchors in toward the center by a corresponding distance (and shortening the ropes correspondingly). Have you had any issues with abrasion on the top rope? I know you mentioned others using 7/64 Amsteel. It would seem like Amsteel (and other rope) would get torn up every time you raised or lowered this stand. Are you sanding out the top holes? I’m wondering if an eye bolt with lag screw threads (drilled into the “inner” side or the top end of the strut) would relieve the abrasion issue (if it is an issue). for mine, i just put a little section of vinyl hose in the holes at the top which seems to work… it also makes it easier to pull the whole thing up and the rope has less trouble pulling through the holes. I recently made this hammock for mysteryland which is a music festival upstate New York and it was amazing. We set it up before hand in my back yard in order to measure out the ropes and make sure it would all work out. We made a few adjustments with the rebars. We had some trouble keeping the ropes from slipping up the rebars so I searched in my she’s for something we could use as a stopper, the only thing I could find were some clips and hose clamps. We tightened the clamps 3/4 of the way up the rebars and clipped the clips from the ropes that belonged on each rebar to below the clamps in order to stop it from slipping up or having the ropes rub on the semi sharp part of the clamp. This made set up even easier then it had been before as well. Since the ropes were already measured out, it took maybe 10 minutes at the most to set the whole thing up once we got to the festival. It survived the 4 days an got a lot of compliments from everyone. We put pool noodles on the stakes in order to avoid any injurys and the tents we had fit well inbetween the stakes in order to keep us within out limited amount of space.The top lines also doubled as clothes lines since it rained heavily the second day n soaked through everything. I have nothin but good to say about this set up and the only this I regret not doing was getting the rings because I can see slight wear on the top rope just from people constantly getting on and off. Thank you so much for this plan! I have a few pictures if you’d like them! Awesome!! Yes, I’d love to see some photos. Curious, did you angle the rebar stakes away from the posts at an angle? I’ve never had slippage issues like you describe when I do this. The rings help a lot. Did you also tie a larks head at the strut on both the side and bottom ropes? Someone mentioned modifying this for 4 people, but I am wondering about 5. Has anyone given that a try? I this would make a great Webelos project/camp-site! After thinking about this for a little while it seems that the equilateral triangles are pretty key to this. That said, what if you used two of these together to provide for a 6-person hang? For multiple folks I’d recommend building a series of tripod bases with ridge poles connecting. It’s easily expandable and very sturdy. 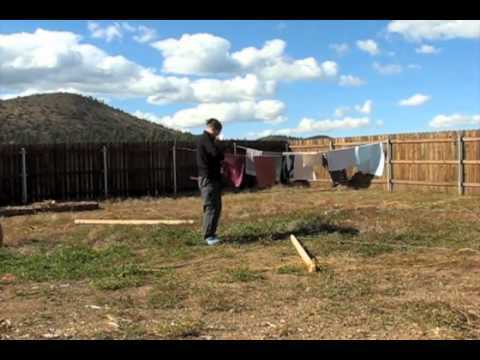 If you live close to a grove of bamboo, they make for cheap renewable yet sturdy poles. That makes sense, Derek. I guess I was really liking the coolness factor of this set-up, so maybe I’ll do both. By the way, I happen to live in southeastern Louisiana and we have a lot of Bamboo down here. Do you think I could swap out the 2×3 boards with some 3″ diameter bamboo? I suppose. You may have to lash out guy points as drilling holes in the bamboo may not be structurally sound. Derek, I built this last year and have upgraded this year to amsteel. I made adjustable loops on either end of thirty feet of amsteel and use a larkshead at the middle for the bottom ropes and side ropes. I think those are too long (or my adjustable loops are too short). When tightened up what does the length of these ropes end up at. Any suggestion for tensioning the top rope with amsteel. Does a trucker’s hitch still make sense? Or would an adjustable loop (giant whoopie sling) make sense? With the poly rope I used last year everything stretched and we had to keep adjusting the whole set up. I haven’t done the stand with Amsteel, but I want to. I think big Whoopie Slings would probably work, but you could probably get away with a trucker’s hitch. Amsteel is notoriously slippery, so test first. Derek, I think I solved the bottom and side rope issue and the stand set up nicely today. Still worried about tensioning the top rope but I might try a couple different options and practice my trucker’s hitch. What is the length between struts? My hammock needs more than 12ft of spread to hang correctly. Twelve feet? You must he hanging a mayan! 🙂 Awesome. The length of the stand can be adjusted by lengthening the inner triangle. You’ll have to make some new calculations, but it will work. I wanted to report my first failure with this stake and support pole system. Instead of using the three person stand set up, I used on support pole, and a tree for the other side (due to no good hanging trees). I used too short of a rope to go to the upper part of my support pole. The up pulling direction pulled the rope up off of my stake (which was re-bar). It makes a very rude wake up at 1:30 am when you hit the ground. To avoid this mistake: Use longer support lines and lay your steaks back a little. Maybe even tie a knot on the stake to make the slide up harder. Built my stand today. Went pretty well. My teenage daughter helped me lay out all the lines and pull it all together and tie the knots. Bonding experience. Laid in it for a moment that spring and boom. One of my rings slipped off and one support came crashing down. Reset the rebar with a steeper angle and all is well. got back in and all was well again. Note the illustration on how the rebar are laid way back, around a 60 degree angle. The struts should be at that same angle. Has anyone done the math for how long the lines should be? Just curious. Other than a steeper angle on the rebar, has a one done anything to keep the rings on the rebar? I made (3) 14′ lines out of twine to be my measuring stick to place the stakes. Placed one stake temporarily in the middle to be my central post and just measured from that. That was easy. I’m glad it is working for you! The angles on the struts should be about 60 degrees, making a equilateral triangle/pyramid shape. The ropes going down angle out a little further as they descend to the rebar. if you have the rebar set at 60+ degrees, you shouldn’t have any issues with the rings slipping. At my last trip, I had two stands going at once and instead of rings, I used those inexpensive steel carabiners that often come with hammocks. They worked great too, and held pretty well when I turned so the small side was on the rebar. Great idea on those inexpensive carabiners and the smaller end on the rebar. Would help the slipping. But I will do better on the 60 degree angle so my steel rings don’t slip off. Well Derek, it’s time for Y.A.T.S., Yet Another Tensegrity Stand, 3 Person Hammock Stand in Texas and I have some questions. What strength line should be used? Does the poly rope do the job or should I hold out and order some Amsteel? There are varying thicknesses/diameters of 3’ rebar, in this case is one size better than another? For the uprights, I’ve seen 2x3s and 2x4s used. Is the smaller sufficient or for 3 adults, should I really go with the larger? Treated or untreated wood or does it matter? 1 line for the side and bottom lines or are 2 better? Mike! Great to see you here. I’ve built a few YATS now, and I’ve done them all with the inexpensive stuff and they work great. Poly rope from Home Depot, 2x3s, and 3′ rebar. I have added the steel O-rings or steel carabiners to reduce the wear on the poly rope when attached to the rebar. I’ve loaded these stands up with three adults and had no issues. However, if I wanted to provide extra security, getting 2x4s and better rope is not a bad idea. The real problem with the poly rope is that it hasn’t been set, so what some folks observe as “stretching” is just the slack being taken out of the rope once a load is applied. I usually take a few extra minutes to work the rope and tighten it over and over to get the stretch out, especially on the side and top ropes. The bottom ropes don’t do a whole lot when the load is applied. Make sure you secure the side ropes. At first I cut and tied them individually, but then I found that I could use 1 rope length, middle it, and tie a simple Lark’s Head knot through the hole and it worked well. I can’t vouch for every style of rope if slippage may occur. I think I had one reader complain of slippage on the side ropes which made the structure topple a little. It is essential that those side ropes are static. 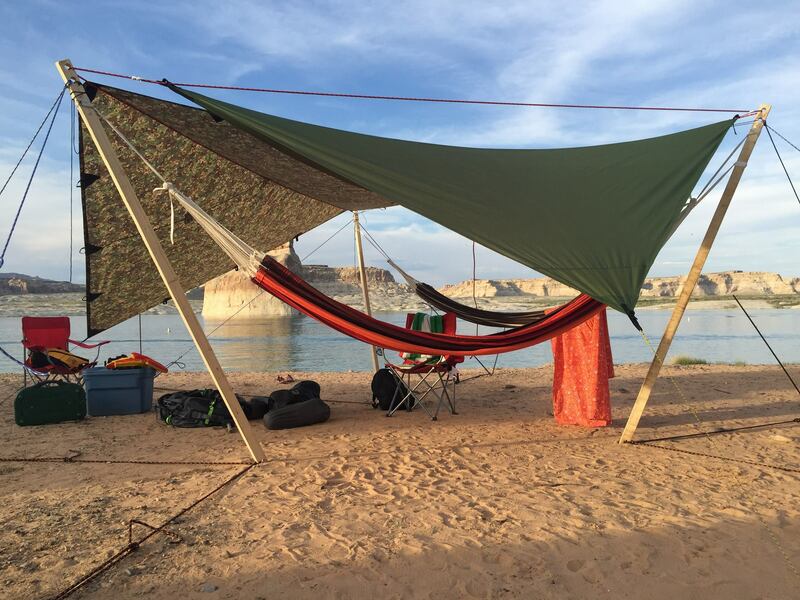 This summer I built two stands and used them at Lake Powell on the sand. I just used the stock materials I have listed and they held rock solid. The only downside was that we had horrific winds and I wasn’t prepared with tarps and tie-outs to match the ferocity of the gales. Yes. This stand holds up nicely with just one person. Just to note, the original plans call for using some cheap poly rope. It works and it keeps the cost down, but it needs to have the slack pulled out of it. Once that happens it holds well. A few people have noticed stretching on those ropes, and that is what is happening. Once the ropes are elongated and pulled they won’t have the same stretching issues. That said, some people have invested in smaller, lighter, stronger rope or cordage. Awesome advice! I was thinking of using the Amsteel. Also, I really dug seeing this in use on your recent post! Have you or anyone you know tried to hand multiple hammocks on a single side of the structure? I am envisioning 2 “eno” style hammocks on each side of the triangle, one strung up just a few feet above the other, for 6 total hammocks. Given that I use properly weight-rated ropes or amsteel, do you think that could work (with the use of a step stool or ladder to enter and exit the “top bunk” hammocks. Did anyone have the experience of the struts snapping when two or more of the hammocks were occupied by adults? No. I’ve used this stand for a few years, often loaded with three adults. Using 2×4 instead of 1×2 will increase the safety factor. We have also ‘double decked’ using these stands when Leaders have brought their kids along, no issues. Just tried this out at a Beaver Colony camp using 2.5mm 12 Strand Dyneema SK78 for the side and bottom guys, and 5mm for the top. Used 90mm 43mm 2.4m treated timber. Worked really well but getting the tension was not easy but a couple of carabiners and prussek loops to create a 3:1 winch affair worked a treat. Need to work on getting the base distances optimal as my hang angle was a bit too extreme due to the length of the hammock. Sounds cool! I’d love to see photos and a trip report. would it be possible to make this hold 9 people by using 6 total 2×3 (or what ever you want to use) but to start with the basic set up of the triangle, then add a post to each side creating a V extension to each of the triangle sides? just a thought if it would hold many people so close. Hmm. I don’t think the struts are designed to be pulled in two opposing directions. It may compromise the tensegrity. I love this stand and my boy scout troop is looking at using this at our bicentennial camporee in march. one question have you ever hung two hammocks between struts? I have not. I suppose it is possible if the two were not too heavy. The Hammock stand worked awesome with six young boys hanging on it. We had some problems with a cpl of the newer stands we made. think the wood was not properly treated. but overall, had a great time and was the center attraction of the camporee. Sweet! I’d love to see some photos. send me your email mine is lov08nascar@yahoo.com. I covered a 2-3″ section of my rebar stakes with a thick layer of electrical tape (about 6″ from the top of the stake). This protects the rope from abrasion and serves as a visual depth indicator when driving the stakes in the ground. Now I don’t have to worry about keeping track of (or losing) steel rings. now to find a tarp maker for this! I would love a single, large circular-ish tarp. and three ridgeline tarps with doors for blowing rain. this looks cool and easy to make… was wondering… the 8′ struts seem a bit big for my jeep and also, i don’t need my hammock that high… could you shrink the whole thing down by making the struts 6’… still keeping the 60° angle, that would make the top about 5′ off the ground which would be plenty high enough for our hammocks. what would that do to my hexagon? actually, it probably wouldn’t be a proper hexagon anymore, would it? do you happen to know what the math would look like on that and is there something else i’m missing that would cause a shorter strut not to work? one other thing i did was have a local welding shop create a 10″ pipe with a piece of still welded on the top as a cap. i put this over each rebar to keep the rebar from vibrating while i drive it in. putting the stakes up goes super-easy with this thing. i don’t see how to post a picture but it is a really simple tool to make…. Send me an email with photos and I’ll post them. Derek, this is an awesome design and I’m planning in using it this weekend. I’m adjusting it to use four 2x4s so I can hang four hammocks. 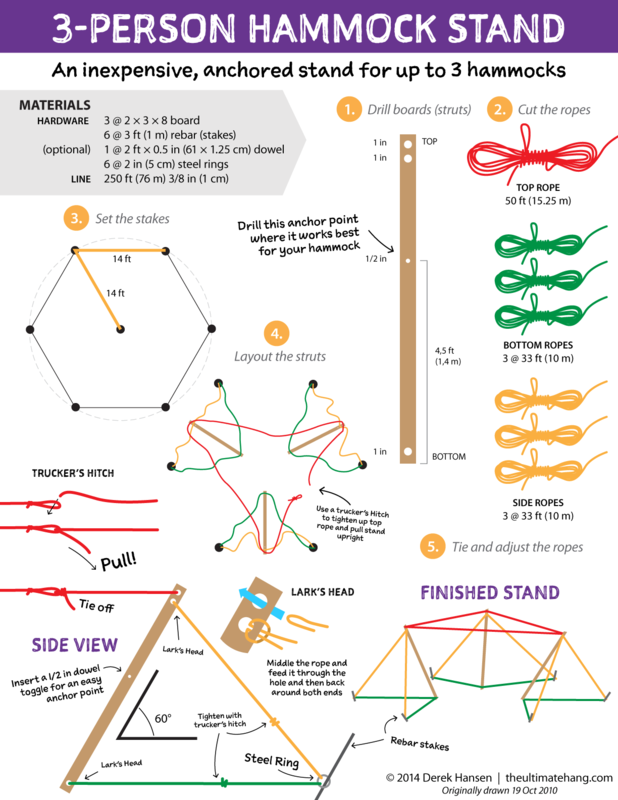 My question is, if you’re aiming for equilateral triangles, how does that work with 14′ ropes but only 8′ struts? I guess I’m just trying figure out how long the bottom and side ropes should be. Hmm. My measurements may be off on the illustration, but in practice, the longer rope allows for adjustments. Derek, thanks so much for posting this! I just purchased a Tentsile Trillium hammock and had the most wonderful time using it this past weekend. I want to figure out how to take it to Burning Man – do you think this setup would work with the Tentsile hammock as well? The hammock holds 880 pounds max (~ roughly 4-5 people). I’m not sure the stand would work with the type of forces used by the Tentsile platform. They are essentially a trio of slacklines, so the pressure exerted would likely be more than the system can handle. It does seem quite magical once it is set up. I’m glad it’s working for you! I have two stands I use often and I’ve had all three hammock positions taken up by grown men and been fine. The cheaper rope holds okay, but if I were to be on the safe side, I might opt for much stronger 1/8″ Amsteel/Dyneema cordage instead. Using Whoopie Slings to adjust the sides would also make it easier to set up and adjust. I’ve added extra hardware in places to reduce abrasion. Is there a limit to how small you can make the small triangle created by the base of the 3 2x4s? And if you make that triangle as small as possible, can you then decrease the radius from 14’? I’m trying to adopt a similar design that had a smaller footprint. Also, how far away were the anchor points for the hammocks from each other? You could reduce the size dramatically. Lots of stands use this basic design, including the DD Hammock Stand. So these are probably dumb questions, but am trying to buy the materials I need to make a run at this thing so here goes. What type of rope did you use? I’ve finding several different types of poly rope (diamond braided, hollow, twisted, etc), which kind did you use exactly and does the working load of the rope matter much? Also, are the 3 foot rebar stakes necessary? Just thinking about driving those things in to the ground and wow, this Arizona soil is HARD and not looking forward to that. Could you go shorter with those? I picked up the braided poly rope from Home Depot when I picked up the wood and stakes. The longer rebar stakes are important because of how much tensions you put on the struts. I use a small mallet to drive the stakes in. I live in Arizona too! it can be hard, but at our last trip up to Lake Powell, it was important to get a deep stake into the sand, even though it was hard soil. The rebar’s smaller diameter driven by the mallet really helps it to go into the ground easier. I also recommend a pair of locking pliers to pull twist and pull the rebar out once you’re done. Hi Derek, can you give more details on the tarp sizes you recommend for getting max shade out of this structure? I’m kind of confused by the diagrams. Thanks for the amazing guide! Sorry for the confusion! It’s really simple, and a basic square tarp is actually the best! A 9×9 or 10×10 would be perfect, either square or turned as a diamond like I show in the illustration. Thanks so much for this design, and for keeping up on answering questions about it after all these years! 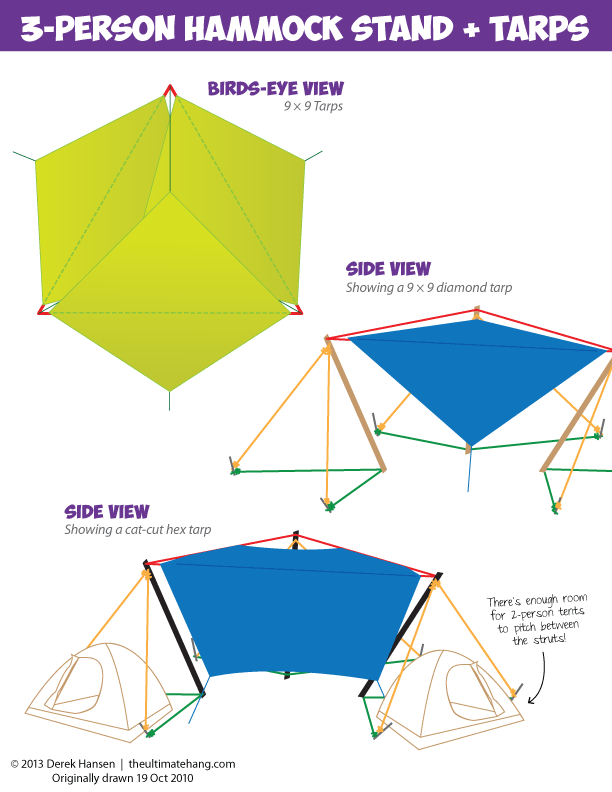 I’m working to put one of these stands together for a week-long desert camping event this fall, and the one place I’m running into confusion with this design is in the question of equilateral triangles. 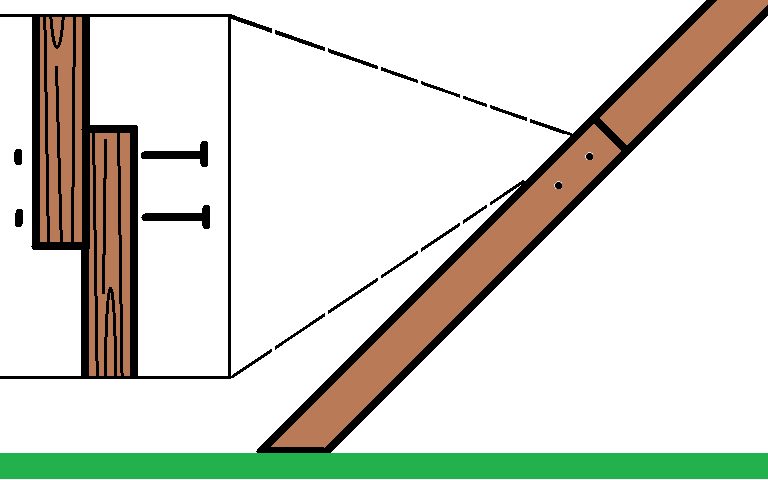 60° angles provide for the most strength and stability, but based on the design it looks like there are some angles that are at 60° — the wood struts where they meet the ground, the corners in the top rope — and others that can’t possibly be 60° angles because of a difference in the lengths of the sides of the triangles. For the ground and side ropes to create an equilateral triangle with 60° angles, each of the sides created by the wood and ropes would need to be the same length, so theoretically the rebar should be no more than 8′ apart, to match the length of the wood. Placing the rebar stakes 14′ from each other means that those triangles won’t be equilateral, even if the wood makes a 60° angle with the ground. The pyramid shape created by the wood+ground rope+side rope would have to be lopsided, not a perfect tetrahedron. Am I misunderstanding something about the design? Or are 60° angles only important in a couple of key areas (where wood meets ground, the top rope)? Is the 14′ measurement important, or just designed to give enough space to hang hammocks between the wood struts? Thanks in advance, and thank you again for sharing this wonderful idea with the internet! You are correct — the triangle isn’t equilateral. It’s more of an ideal or approximation than reality. The struts are more important to have at that angle. You can adjust the design to make the struts shorter, for example, or make the ropes longer. Aiming for equilateral keeps the stretching the a minimum and makes the loads balance better, but in real life, there is a lot of fudging. The 14 foot measurement is also an approximation that can be adjusted. It allows for long hammocks and tarps to be used, but you can shorten it to some degree. The photos show how hammocks fit. I did it! I made this stand a week or two ago and can’t wait to bring it to the burn this year. Thank you so much for the design and sharing you thoughts and answering questions. One thing that helped me was to tighten the bottom ropes first, to help keep the bottom of the struts in the correct position. I then left plenty of slack on the top lines which pull down. After raising the straights to slightly > 82 inches from the ground (the correct length for 60 degrees) I tightened them down. Worked great but definitely took a few tries and some trial and error. That’s awesome! Glad it worked out and thanks for your insights. Your smile says it all! Best of luck at the burn!